Posted on April 21, 2016 at 5:00 pm. Buying a new HVAC system can be one of the largest purchases you can make for your household or business. When deciding what to buy it is recommended you do a comparison of products so you make the best choice suitable for your needs. 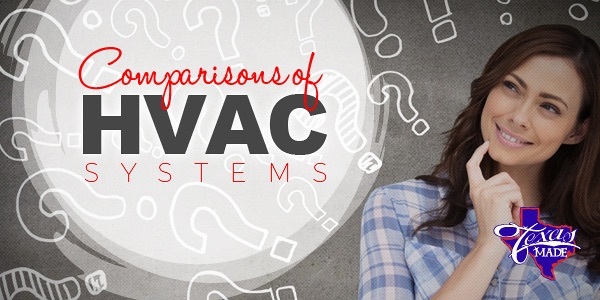 The most common HVAC system is a split system. This is the traditional system found in the majority of houses. It consists of inside and outside components. There will be a refrigerant cooling air conditioner, an evaporator coil and a furnace and fanto circulate air and convert refrigerant. Air will be carried through your home or business via ducts, and there is a thermostat or control panel that allows you to set your desired temperature. For improved efficiency you can consider a hybrid HVAC split system. This type of model gives you an option of having an electrically fueled heat pump different from the traditional gas furnace. It can save you money on your power bill. This system will have a heat pump that cools or heats the refrigerant, an evaporator coil and a furnace to circulate the air and work with the refrigerant, and ducts to move the air around. If you determine you have numerous areas where ducts can’t go by using a traditional system. You can go duct free! A duct free system will have an air conditioner or heat pump to cool and heat the refrigerant, a compact fan coil, tubing for the refrigerant and wires connecting the fan coil to the unit outside, and a normal thermostat or control panel. If your home or office is too small for one of the previously mentioned systems, you can purchase a packaged heating and air conditioning system. It basically comes without all the separate components. For example, the heat pump/air conditioner is in one unit with the fan coil/evaporator. No matter what your needs are, there is a system that will work well for you. Read reviews and do a comparison to help you make up your mind. Remember, a certified technician can help you choose what system is best for your situation.